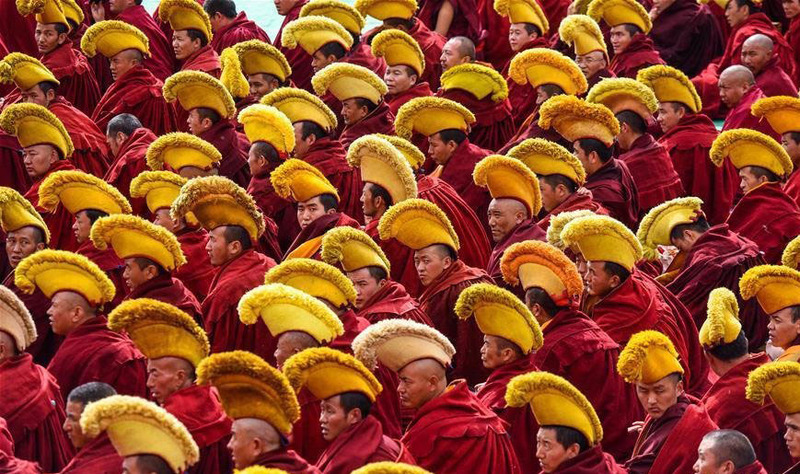 (TibetanReview.net, Jun06, 2018) – China said Jun 4 that it had held from May 31 to Jun 2 in Tibet’s capital Lhasa a workshop for Buddhist monks and nuns tasked with training the monastic communities to be loyal subjects of the Communist Party of China and the Chinese state run by it. The trainees were tasked with spreading government policies to strengthen the monks’ and nuns’ political beliefs, reported the official globaltimes.cn Jun 4. The Buddhist facilitators, as the trainees were called, were asked to be reliable in politics and take a clear-cut and firm stance, which was one of four standards they were required to follow, the report said, citing the official Tibet.cn Jun 4. Apart from the requirement of being reliable in politics, the “four standards” were stated to ask the monks and nuns to be profound in religious knowledge, be convincing in morality and to play an active role at critical moments. The workshop participants, described as active or young monks and nuns in temples willing to learn and share with others, were now required to hold educational activities as their major political mission on a long term basis. “Buddhist temples play a key role in Tibet’s stability. The facilitators spread the latest religious and political policies and spirit from the central government to monks and nuns, leading them to advocate socialist development with Chinese characteristics,” Xiong Kunxin, a professor at Beijing’s Minzu University of China, was quoted as saying. Having the Buddhist facilitators preach policies to monks and nuns is more effective than through a third-party lecture or directly from the central government since they have a better understanding of the thoughts and habits of their own group, Xiong was cited as saying. Presenting the facilitator project in context, the report said, citing Tibet Daily, that following the 19th National Congress of the Communist Party of China in Oct 2017, more than 20,000 Party cadres in Tibet Autonomous Region (TAR) were sent to local villages, 7,000 to temples to preach the spirit of the 19th CPC National Congress among Buddhist monks, nuns, students and farmers. The facilitators were stated to have been chosen based on the firmness of their political stance and competence. “They were selected from Party cadres, grassroots farmers or herders, teachers, temple officials and patriotic religious personnel, a Tibet Daily report was cited as saying in 2017. It said the facilitators receive regular training to better spread knowledge and policy to the public. “Tibet is the key to national security and the frontline of the anti-secession struggle. The report of the 19th National Congress calls for the acceleration of border area development and to ensure its security,” the Tibet Daily report was quoted as saying. Referring to the emphasis being given to the facilitator project, the report said that more than 260 representatives of facilitators in the TAR were gathered in Apr 2017 to learn how to better promote the idea when launching a “patriotism-themed” education activity. To better spread the spirit of the 19th National Congress, more than 100 leading facilitators also received intense training, the Tibet Daily report was cited as saying.